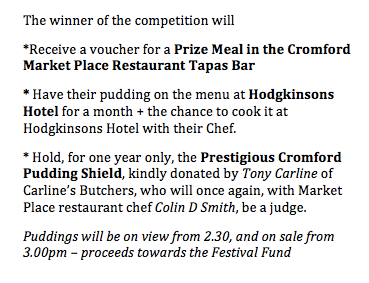 Last Saturday in the glorious sunshine and a throng of activity around Cromford it was the pleasure of Tony Carline and I once again to judge this year’s Pudding Competition. Although the number of entries had dropped, the quality of the pudding continues to rise. Our home-bakers had clearly put a lot of thought and consideration into interpreting the theme of ‘A Pudding for all Seasons’. The design and use of ingredients was ingenious. It was clear that Deborah Fry’s presentation, flavours and culinary skill, together with the clever use of Vivaldi’s Four Seasons music for the collection of her ingredients throughout the year, was the standout winner for the second year running. Her Pork, Potato and Turnip Pie, with a sage butter crust, jam glass record and chutney, was outstanding. Jenny Knighton in second place gave Deborah a good run for her money. She too understood the brief with meringue winter snow, autumn orange and almond pastry and a delicious filling of spring rhubarb and vanilla custard. Susie Romer’s gluten free cake came third. Her decorated toppings of crushed Trebor mint snow, edible lavender rain and sunshine satsuma was lovely, moist and a delight to eat. So come on bakers, young and old. Rise to the challenge in 2015. Get your thinking caps on, perfect those culinary skills and get your entries in on time. Finally I would like to thank our sponsors for their generous prizes and my employer for allowing me the time to judge on a very busy day at The Tapas Bar.